Can Powertech submit South Dakota permit applications and attract more equity capital before running out of cash? On November 14, Powertech released its financial statements for the quarter ended September 30. The Canadian company had negative cash flow of $4.5 million for the quarter, no revenue, and a net loss of $1.1 million. The numbers raise doubts about Powertech's chances for survival. The decision to incorporate additional technical information from a final pump test has resulted in a revision in the schedule for filing all permit applications for the Centennial Project. The Company now intends to submit the necessary permit applications for ISR operations to the United States Environmental Protection Agency, the Colorado Department of Public Health and Environment, Colorado Department of Natural Resources and Weld County in the first half of calendar 2009. 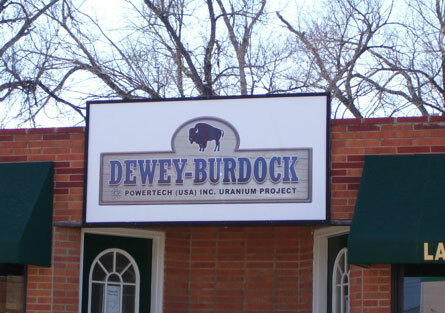 The financial statements reveal that, for the last two quarters, Powertech has been spending more money advancing the Dewey-Burdock project in South Dakota compared to the Centennial project ($3.5 million versus $2.3 million). Less than a half a million dollars was spent on the Wyoming and New Mexico projects. Powertech says permit applications for Dewey-Burdock should be submitted by the end of this year. It seems clear that the company's strategy is to push Dewey-Burdock, submit permit applications, and leverage that progress to attract more equity capital. The Dewey-Burdock project is opposed by Defenders of the Black Hills. Powertech may need more time to attempt to deal with problems associated with the Centennial project such as House Bill 1161 rulemaking, unsaturated uranium deposits, uncooperative landowners, political opposition, and the aforementioned pump test results. Powertech was nearly out of cash when it persuaded Belgian company Synatom to buy a chunk of the company for $9 million in early June. Most of that cash is now gone; Powertech's working capital as of September 30 was only $2.4 million. During the most recent quarter, Powertech burned through its cash at a rate of $1.5 million a month. At that rate, and assuming no new financing, Powertech could be insolvent by Christmas. operations when they come due. It is worth noting that this is the first time Powertech has included a "going concern" statement in its financial statement notes. This warning to investors is required when a firm's financial position is so weak that its future survival is in question. But can't Powertech simply issue and sell more company stock to investors? Perhaps, perhaps not. For one thing, Powertech's stock price has fallen to only $0.21 US (as of 11/21/08). To raise $10 million, Powertech would have to sell nearly 48 million shares of stock. The company currently has only 55 million shares outstanding. Existing shareholders, including Powertech executives, would see their current ownership stake and voting power significantly diluted. For comparison, Powertech only had to sell 6 million shares to Synatom to raise $9 million when the stock price was $1.50. More importantly, with the crisis in financial markets and lower uranium prices, investors are showing a reluctance to invest in "junior" uranium companies. Shares of companies such as Powertech that have little cash, limited financing options, uranium properties in politically-inhospitable areas, or uranium deposits that may not be easily recoverable are being dumped by investors. So will Powertech's "South Dakota first" strategy work? Permit applications may be submitted. Perhaps Synatom will kick in a few million to keep Powertech alive for a few more months (even though on paper it has lost over 80% of its June investment.) But Powertech could just as easily be unable to find financing, run out of cash, and close up shop. The international financial crisis and relatively low uranium prices could spell the end of Powertech, but one can't ignore the company's misguided decision to pursue uranium mining in a heavily-populated area of northern Colorado where water is a scarce resource and people go to great lengths to protect it.